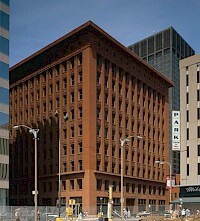 The Masonic Temple Building was a skyscraper built in Chicago, Illinois in 1892. Designed by the firm of Burnham and Root and built at the northeast corner of Randolph and State Streets, the building rose 22 stories. 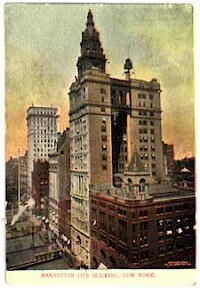 When the clock tower was removed from the 1885 Board of Trade Building in 1895, the Masonic Temple became the tallest in the city. The building featured a central court ringed by nine floors of shops with offices above and meeting rooms for the Masons at the very top. 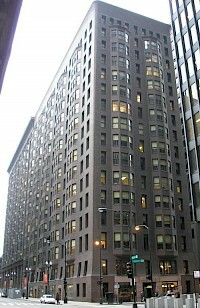 The Manhattan Building is a 16-story building at 431 South Dearborn Street in Chicago, Illinois. It was designed by architect William Le Baron Jenney and constructed from 1889 to 1891. It is the oldest surviving skyscraper in the world to use a purely skeletal supporting structure. 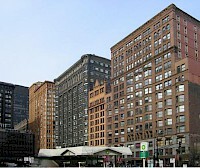 The building was listed on the National Register of Historic Places on March 16, 1976, and designated a Chicago Landmark on July 7, 1978. The Manhattan Life Insurance Building, at No. 1 Wall Street, was one of the earliest skyscrapers of New York City. 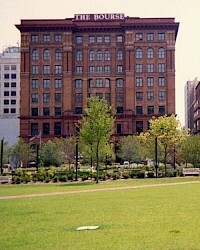 The building, which rose to 348 feet (106.1 m), was completed in 1894 to designs by the New York firm of Kimball & Thompson, and was slightly extended in 1904. It was the first skyscraper to pass the 100 meter mark. 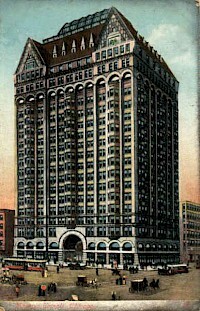 Thomas Building was a high rise building in Indianapolis, Indiana. 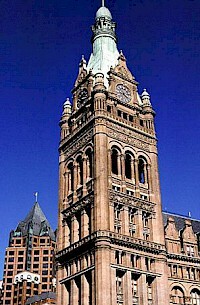 It was completed in 1895 and had 13 floors. It was primarily used for office space. It was destroyed by fire in November 1973. Latter & Blum Building, originally and historically known as the Hennen Building, is an 11-story, 158 feet (48 m)-tall skyscraper in New Orleans, Louisiana USA. A Registered Historic Place, the building is located at 203 Carondelet Street at the uptown lake corner with Common Street, in the New Orleans Central Business District. 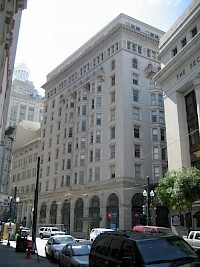 The building is New Orleans' first and oldest skyscraper, holding the title of the city's tallest building from 1895-1904.